Pythagoras conceived the universe to be an immense monochord. Instruments derived from the monochord (or its moveable bridge) include the guqin, dan bau, koto, vina, hurdy-gurdy, and clavichord ("hence all keyboard instruments"). A monochord, also known as sonometer, is an ancient musical and scientific laboratory instrument, involving one (mono) string (chord). 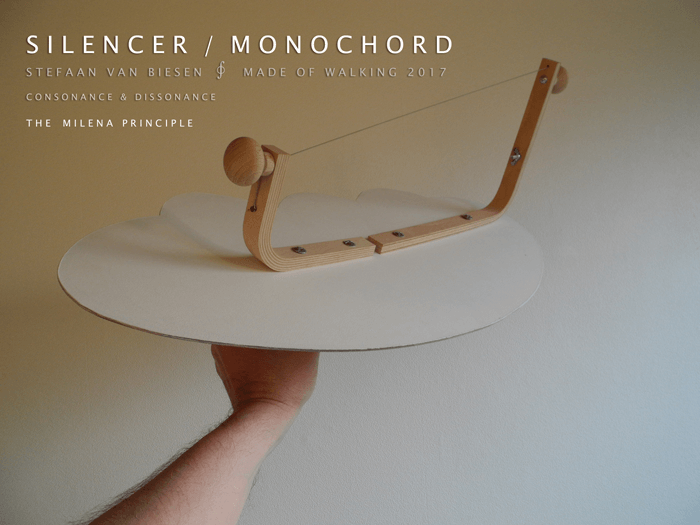 The term monochord is sometimes used as the class-name for any musical stringed instrument having only one string and a stick shaped body, also known as musical bows. According to the Hornbostel–Sachs system, string bows are bar zithers while monochords are traditionally board zithers. The 'harmonical canon', or monochord is, at its least, "merely a string having a board under it of exactly the same length, upon which may be delineated the points at which the string must be stopped to give certain notes," allowing comparison. A string is fixed at both ends and stretched over a sound box. One or more movable bridges are then manipulated to demonstrate mathematical relationships among the frequencies produced. "With its single string, movable bridge and graduated rule, the monochord (kanōn [Greek: law]) straddled the gap between notes and numbers, intervals and ratios, sense-perception and mathematical reason." However, "music, mathematics, and astronomy were [also] inexorably linked in the monochord." A total sensorial experience of our environment is only possible if all our senses are redefined in a harmonious perception and 're-fine-tuned' by a ' feeling thinking / feeling thinking'. Color, smell, sound, feelings, are a (higher or lower) octave of each other. On one long imaginary string, they flow from one to the other. All these stimuli and sensations are a manifestation of vibration (or frequencies) at different levels. In this way, the color 'red' is another harmonic manifestation of the tone 'do'. A Scent Of Silence is an exercise in resonance, the awareness that we are more than just 'form'. Everything in the universe is reducible to a number and frequency and is related to each other. We are sensible moving color and sound. During this sensory walking workshop we allow walkers to meet with their individual 'tone' and 'color(s)'. We will use the colors that were defined by the great Russian tone poet and composer Aleksandr Scriabin (1872-1915) (as a homage to this extraordinary musician), who emphasized the strong relationship between tone and color into his own musical compositions. Starting from the Shen Dao system of each person's neutral base color (personalized and determined by year of birth, and linked to the nourishing, soothing, controlling, draining colors and their functions) in relation to the 5 elements.